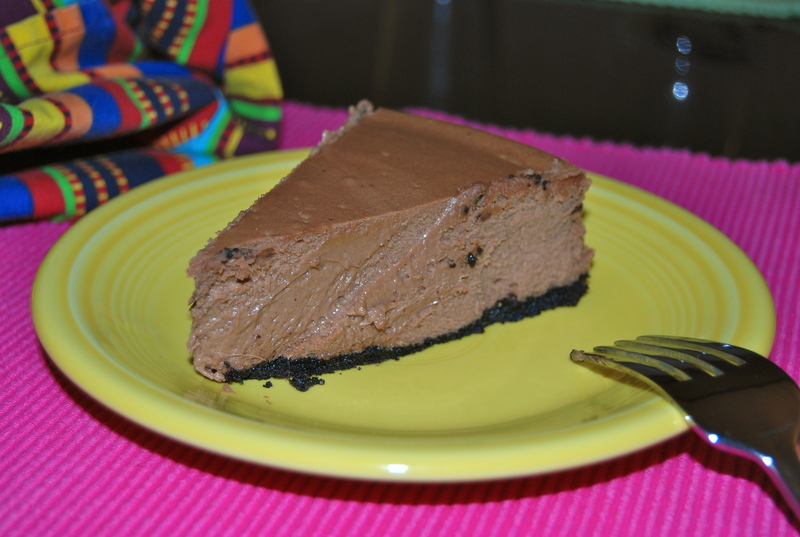 Double Chocolate Cheesecake. What more needs to be said? This was a delicious, light dessert. I will definitely make this again. I did omit the garnish of blueberries and powdered sugar, and went for the pure chocolate experience. The recipe is from a magazine, and it was developed by Kraft Foods, the makers of Philadelphia cream cheese. Good job! Heat oven to 325. Mix cookie crumbs and butter, and press into bottom of a 9 inch springform pan. Bake 10 min. Beat cream cheese, sugar, flour and vanilla with mixer until well blended. Add melted chocolate; mix well. Add eggs, 1 at a time, mixing on low speed after each just until blended. Pour over crust. Bake 55 minutes to an hour or until center is almost set. Run knife around rim of pan to loosen cake; cool before removing rim. Refrigerate 4 hours. Top with blueberries just before serving; sprinkle with powdered sugar. 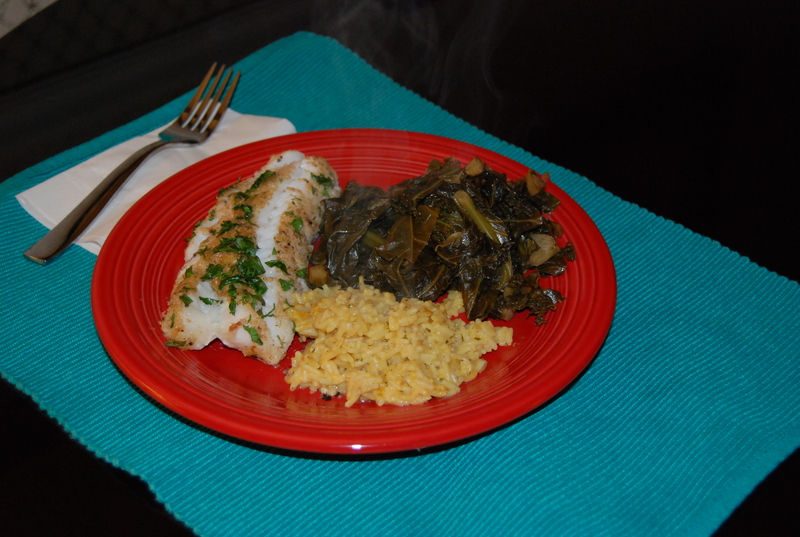 Today’s recipe is for Southern-Style Greens from Ellie Krieger’s Comfort Food Fix. We had them with baked cod and garlic rice. Quite delicious! I have never made greens like this before, and they were really tasty. They would be good with fried chicken, I think. Okay , so I haven’t posted in a while, but I did make this recipe over a week ago. 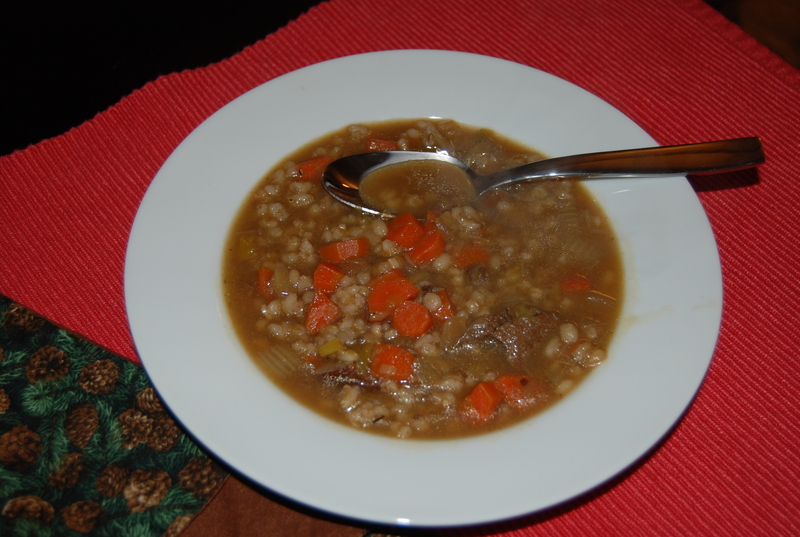 I made Rich Beef Barley Soup from Ina Garten’s, “How Easy is That?” cookbook. It was delicious! Of course, I made a few little changes, nothing drastic. It called for oxtails, which I couldn’t find anywhere, so I used a beef shank. I also used dried thyme instead of fresh. Otherwise, I followed the rules, and it tasted great. Heat the oil in a large pot or Dutch oven. Add the oxtails, 1 tsp. salt and 1/2 tsp. pepper and cook over medium-high heat, stirring occasionally for 10 minutes until browned all over. Remove the oxtails with a slotted spoon and reserve. Add the leeks, carrots, onion, celery, and garlic to the fat in the pot and cook over medium heat, stirring occasionally, for 10 minutes, until the vegetables start to brown. Tie the thyme sprigs together and add to the pot along with the bay leaves. Return the oxtails to the pot and add the broth, 1 tsp. salt and 1 tsp. pepper. Raise the heat and bring to a boil. Lower heat and simmer for 1 hour. Discard, thyme bundle, bay leaves, and skim off the fat. Meanwhile, bring 4 cups of water to a boil and add the barley. Simmer uncovered for 30 minutes, drain, and set aside. When the soup is ready, add the barley and cook for another 15 to 20 minutes, until the barley is tender. Serve hot with or without the oxtails (I shredded the meat from the beef shank and added it). It was very hearty and very delicious! Today’s recipe was from Bobby Flay’s Bar Americain cookbook – Pumpkin Soup with Cranberry-Maple Creme Fraiche, Toasted Pumpkin Seeds, Chives. We had our first flop. 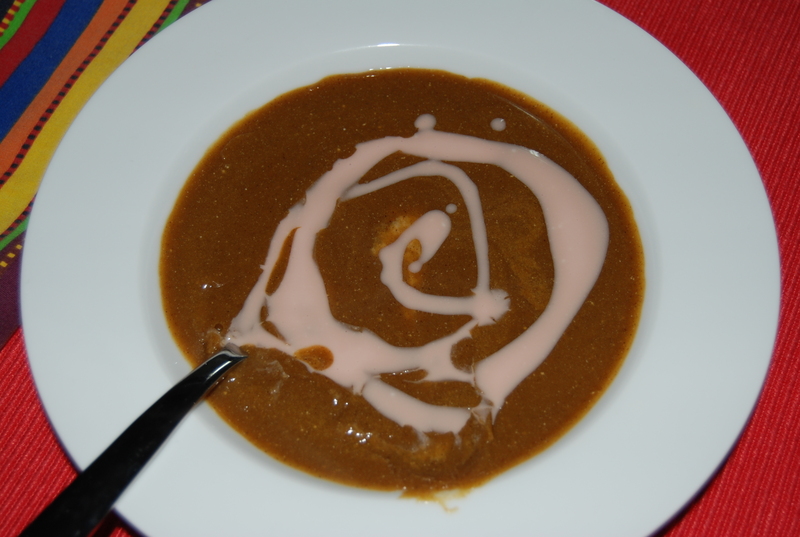 The soup was simple to make, but it was heavily spiced with cinnamon and cloves. John is not a fan of cloves, and I admit, this was too much even for me. The cranberry-maple creme didn’t work out either. I used sour cream instead of creme fraiche, which was suggested as a substitute, and the creme was very thin instead of sour cream-like. I might try this again in the future omitting the cloves and cutting back on the cinnamon. I guess all the recipes can’t be keepers! Put the pumpkin puree in a large saucepan, whisk in 3 cups of stock, and bring to a simmer over medium heat. Add the cinnamon, allspice, cloves, honey and maple syrup. Simmer for 15 to 20 minutes. Whisk in up to 1 1/2 cups more stock if the soup is too thick. Remove from heat and whisk in the creme fraiche or sour cream. Season with salt and pepper. Top with a dollop of cranberry-maple creme fraiche and toasted pumpkin seeds and chives. Bring the cranberry juice to a boil in a small saucepan over high heat. Cook, stirring occasionally, until thickened and reduced to 1/4 cup, about 10 minutes. Remove from the heat, stir in the maple syrup and extract, and let cool to room temperature. Put the creme fraiche in a bowl, add the cranberry mixture, and stir. Season with salt. Cover and refrigerate for at least 30 min. and up to 1 day to allow flavors to develop. Tonight, I made two new recipes for dinner. Honey-Crisp Oven Fried Chicken is from Ellie Krieger’s book, Comfort Food Fix, and Frizzled Brussel Sprouts with Pancetta & Walnuts from Anne Burrell’s, Cook Like A Rock Star. Let me just say, yum & yum! Both recipes were very simple, and they were both very flavorful. No need for the salt & pepper shakers tonight. I did make a few substitutions in the recipes as I didn’t have all the exact ingredients. The chicken recipe called for chicken thighs, but John and I like boneless breasts, so I used those. I was supposed to use honey, but discovered I was out, so I used golden syrup. My daughter, Heather, keeps me supplied with this British product which is a cross between honey and Karo syrup. 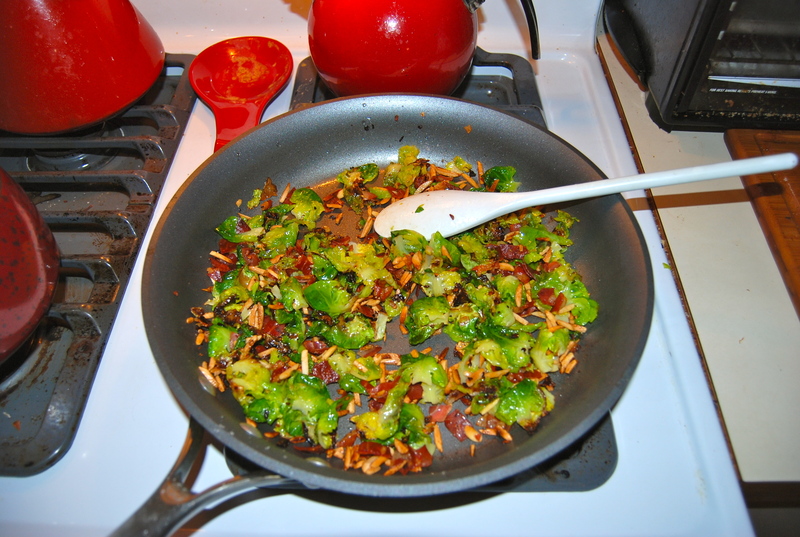 In the brussel sprout recipe, I substituted slivered almonds for walnuts. They worked just fine. John proclaimed both recipes keepers. So far, so good! Here are the recipes. I hope you enjoy them! Place the chicken in a bowl with the buttermilk. Marinate in the fridge for at least an hour and up to 4 hours. Place the cornflakes in a food processor and process until crumbs form. Transfer to a shallow bowl and add paprika, garlic powder, salt, black pepper and cayenne. Preheat oven to 350°F. Spray a baking sheet with cooking spray. Remove the chicken from the buttermilk, shaking off excess. Discard remaining buttermilk. 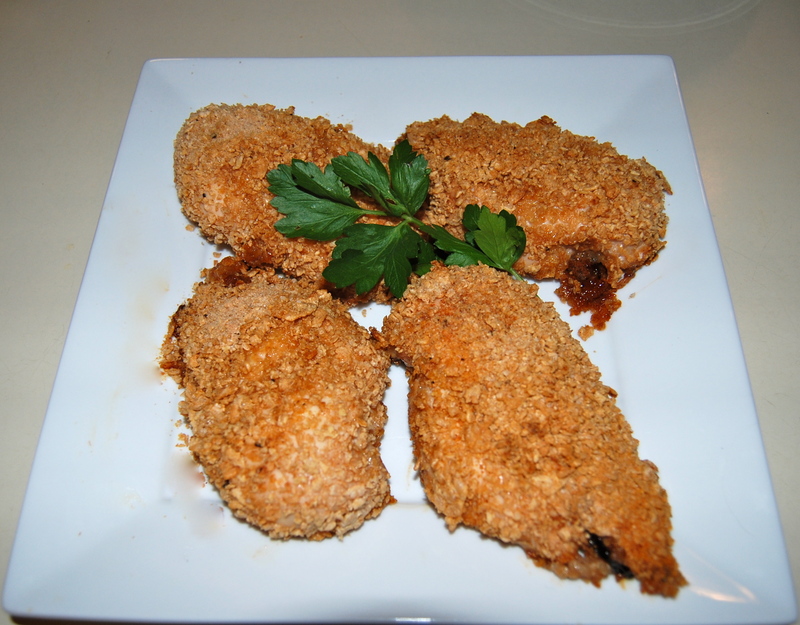 Brush chicken with honey, then dip in the cornflake crumbs, pressing hard so crumbs stick. Place the coated chicken on the baking sheet and lightly spray the top of each with the cooking spray.Bake until the chicken is crisped and cooked through, 45 to 50 minutes. Coat a large saute pan with olive oil; add the garlic clove and red pepper and bring to medium heat. When the garlic has turned brown, discard and add the pancetta and walnuts. Cook until pancetta is crispy and brown, about 5 minutes. Add the Brussel Sprouts and toss to combine. Season with salt ( go easy on the salt because the pancetta is pretty salty on its own), cover and cook for 2 to 3 minutes until the sprouts have wilted. Remove the lid, raise the heat to medium-high, and let the sprout leaves brown and “frizzle”, 8 to 10 minutes more. Today’s recipe comes from Mexican Made Easy by Marcela Valladolid. This is a show on the Food Network, but I have to admit, I’ve never seen it. This is another of the new cookbooks I received from John this Christmas. The recipes are very simple, and the ingredients are mostly ones I have on hand. Tonight, I made Yukon Potato, Poblano, and Corn Gratin. It’s sort of a Mexican scalloped potatoes. I didn’t have the exact ingredients, so I substituted russets for yukon gold potatoes, mozzarella for Oaxaca cheese, and sour cream for Mexican crema. The author gives you these choices so you don’t have to search for the specialized ingredients. The most fun part was charring the poblano peppers on the gas stove, and then steaming them in a plastic bag. The skin came off really easily, and they had a slightly smoky flavor. I sliced the potatoes, then layered them in a deep dish pie plate. First layer, potatoes. Second layer, sauteed corn and poblano pepper strips. Third, a layer of mozzarella. I repeated that sequence and ended with a layer of potato slices. I mixed together the sour cream and half and half and poured that over the top. I salted and peppered every layer. I covered it tightly with foil, placed it on a cookie sheet, and baked at 400 degrees for 30 minutes, then uncovered for another 40 minutes until brown and bubbly. We had it with a tasty meatloaf and fresh green beans. John declared this another keeper! Here’s the recipe. Enjoy! Preheat oven to 400 degrees. Coat a 9 1/2inch round deep dish glass pie plate with 2 tsps. oil. Heat 1 tsp. oil in large skillet over medium heat. Add the corn and saute until tender, about 5 minutes. Add the poblano strips and season with salt and pepper. Remove from heat. Arrange 1/3 of potatoes in the dish. Sprinkle half of poblano mixture over and top with 1/3 of the cheese. Repeat, adding a second layer of everything. Top with a layer of potatoes. Stir together half and half and crema. Season with salt and pepper. Pour over top. Top with remaining cheese. Cover tightly with foil, place on baking sheet. Bake for 30 minutes. Remove the foil and bake until brown, bubbly and potatoes are soft (This took me a little longer-about 40 minutes more). Let stand 10 minutes before serving. Today, I decided to try a recipe from Bobby Flay’s Bar Americain Cookbook. John took me to Bar Americain for my birthday, and we had a fantastic meal, so I asked for this cookbook on my Christmas list. Since I still had turkey left from Christmas dinner, I was looking for something new to do with the leftovers. This recipe actually calls for you to roast a turkey breast, but I was one step ahead. The recipe is for Kentucky Hot Browns. The book says that this dish was named for the hotel where it was first served, the Brown Hotel in Louisville. It has become a traditional dish for Kentucky Derby goers. Basically, this is an open-faced, hot, turkey sandwich served on french toast with a yummy cheese sauce. I cut the recipe in half because only John and I were eating and it serves 4 or 8. It was very easy to make. First, I fried up some bacon, 5 slices. Next, I sliced a big tomato, brushed it with oil and sprinkled with salt & pepper. I put them under the broiler until they were warm and a little charred around the edges. While they were broiling, I made a simple bechamel sauce and added grated white cheddar and parmesan, salt, pepper and a dash of nutmeg. Next, I made 4 slices of french toast – milk, egg, s & p. Once they were done, I assembled the sandwiches on a baking sheet – one slice of french toast, 2 thick slices of turkey, cheese sauce, and a little more grated cheese. 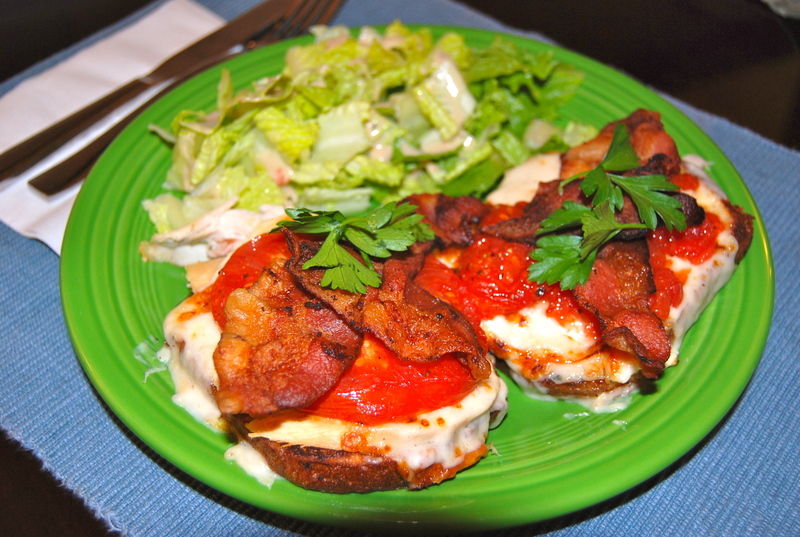 I let them get brown and bubbly, then topped them with the warm tomato slices and bacon. I added a little sprig of parsley and some greens on the side. John and I agreed that this was a very tasty dish. He suggested that it would be good for a dinner party as one slice would be a serving along with some veggie sides. This one’s a keeper! Here’s the recipe. Remember, I cut it in half for the two of us. Put the milk in a saucepan and bring to a simmer over low heat. Melt the butter over medium-high in a medium saucepan. Whisk in the flour and cook for 1 minute. Gradually whisk in hot milk. Bring to a boil and whisk constantly until thickened. Remove from the heat and stir in cheeses. Season with nutmeg, s & p.
Whisk the eggs and milk in a baking dish. Season with s & p. Dip each slice of bread and completely soak. Heat the butter in a frying pan and cook slices until golden brown on each side. To assemble the sandwiches, put slices of french toast on a baking sheet. Top with turkey slices. Cover with cheese sauce. Sprinkle with more cheese. Place under broiler until golden and bubbly. Top each with the charred tomato slices, strips of bacon and parsley.